An interdisciplinary journey through photography, anthropology and geology led Associate Professor of Art Michael Kolster to a remote, garbage-ridden beach on Hawaii’s Big Island last March. It all started after Kolster read an article in the New York Times that described the work of three geologists who traveled to Hawaii in search of a new kind of stone called “plastiglomerate,” formed by discarded plastic fused with rock. Kolster’s interest was piqued by the article’s claim that these artificial stones would become a permanent part of the geological record—a kind of fossil of the future. “These particular objects will become portraits of us for whoever uncovers them hundreds or millions of years from now, and they will indicate a moment of geological time where humans have begun to alter geological history,” Kolster said. He contacted the researchers cited in the New York Times article in hopes of seeing the plastiglomerates for himself and discovered that the researcher in possession of the physical plastiglomerate samples was a visual artist. The artist refused Kolster’s request to photograph the objects as she planned on incorporating them into her own artistic project. Not to be deterred, Kolster was awarded a Faculty Research Award to travel to the remote Kamilo beach, known also as “junk beach” for the massive quantities of refuse that wash ashore, where the original samples had been found. With the help of a local resident, Kolster spent a day photographing plastiglomerates, other trash and the general landscape. Kolster said that it was the beach’s imperfections that he found most compelling. He hopes his work will encourage viewers to look for beauty and opportunity in places one might consider flawed. Kolster captured the plastiglomerates using the technique of stereography, which, when viewed properly, allows the audience to experience the images in three dimensions. According to Kolster, the experience of viewing stereographs pushes viewers to engage more actively with the images. Additionally, the technique is often employed by scientists when documenting data in order to create a more accurate representation of their subjects. Kolster hopes to publish the project, titled “Chronicle of the Geologic Record Foretold” as part of a larger collection of his work. 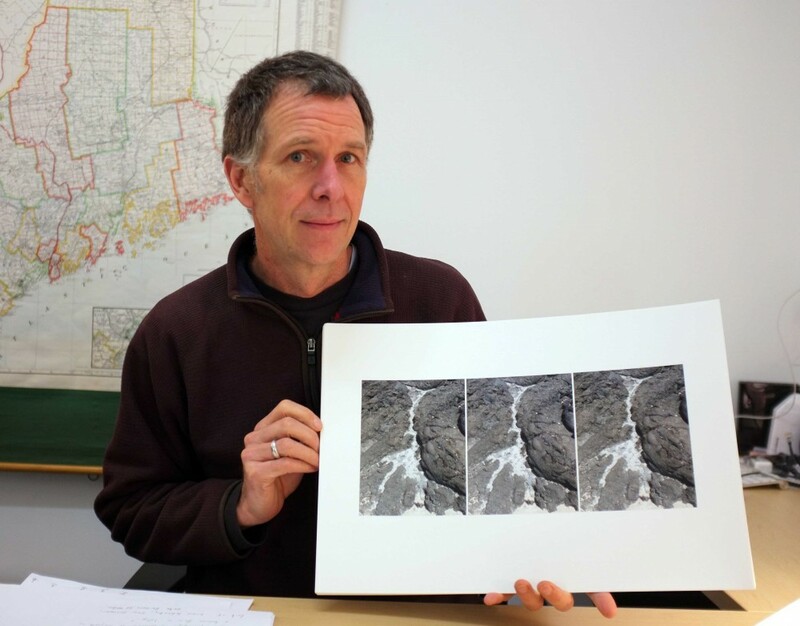 He said that one of the most rewarding parts of this project was the way in which it connected unexpectedly to some of his other recent projects, including a photographic study of rivers across the country, such as the Los Angeles and the Androscoggin rivers. Both projects represent nature in a singular temporal moment, yet seek to encourage the viewer to contemplate nature’s constancy. “When you look at a still picture you realize it isn’t life. So then you ask yourself, what is life? Life is change and flux. And a photograph basically stands in relief to that,” Kolster said.